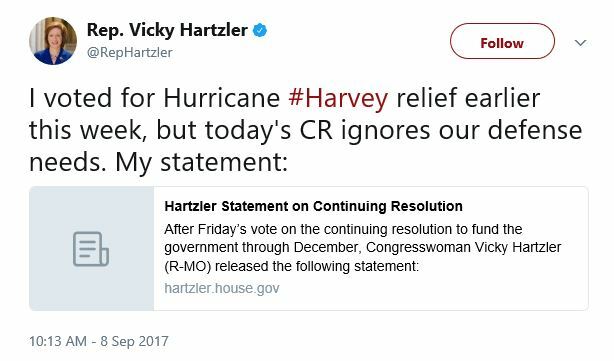 Rep. Vicky Hartzler (r): What’ll be the excuse for voting against Hurricane Irma disaster aid? Will it be the same one? Just asking. Well, no, let’s face it, you voted against Hurricane Harvey relief. Own it. You also voted against raising the debt limit to pay for what Congress has already spent. Do you have any idea what the failure to meet the obligations of the government would do to the country and its economy in a shutdown in the immediate aftermath of several large scale natural disasters? Evidently not. If your party’s defense bills were good, you wouldn’t have to tie it to an essential item like hurricane relief in order to get it passed. Whatever. You’ll always just be remember for voting against funding Hurricane #HarveyReliefBill. Way to go. Maybe… just maybe… more of your colleagues think it is important to help people in need than it is to buy another tank we won’t use? How does it feel being ignored? Your constituents sure don’t like it. We are not stupid. If your side prevailed, there would have been no money for hurricane relief. You can’t have it both ways. You have 3 months to work on a budget; however, noone to blame but GOP Leadership. To many non work days and August off with so much to do. Go to Houston and see the destruction. Schools are cancelled for the year. People have no place to stay. Heartless Hartzler.